Before the men of the forum get to 'enjoy' derailing this thread in their own way, I hope that Kili and Kiwi are fine and that it was just a regular check up and inoculations. Yes they are. Just needed their yearly vaccinations. Celaglar , glad to hear this. Great pictures Celaglar. Even if the light is a bit harsh. The whole statue looks like a winner. How did you find the water effects in person? Overlooked your comment. The water effect looks good, but from up close not really like water. However, the water is wild so it shoudn't be too much look through. For everybody who wants to know: The horse is only supported by its legs. The legs click into the base and are held with a magnet I think. The tail is attached later on, as well as the arm and purple robe. Last edited by Celaglar; 7th February 2019, 19:27. Mine just arrived Unwrapping it tomorrow, or this weekend. Putting one of our cats (he's only 2 years ) down to sleep tonight And unwrapping is something nice, so I don't want to combine that with something sad.. Sorry to hear that, good luck tonight. 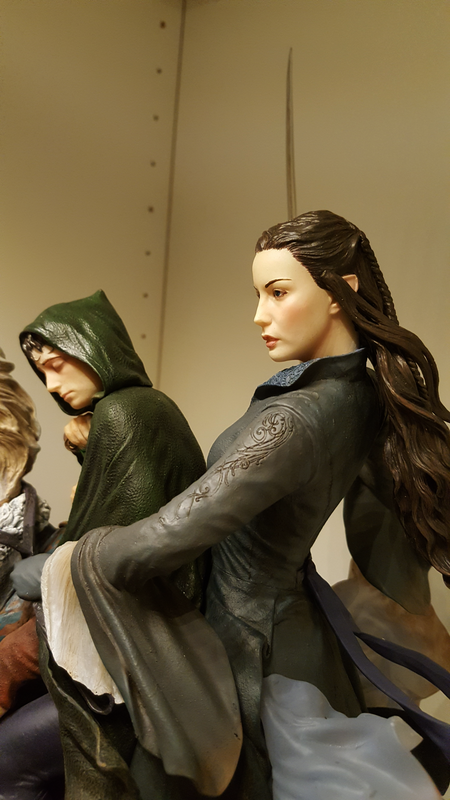 I haven’t seen Thranduil, but I don’t think Arwen really needs adjusting. However, I thought of why she looks off. The statue has a lovely face, she looks sweet. However, in the movie she looks angry and fierce. I think that is why people think she does not have a good likeness. Can imagine if you work on her she would look even better! I thought the same thing when she was first revealed. The look on her face doesn't quite match the moment in the film. The likeness is definitely there, no question. She just looks a bit too mellow. From the left she looks great and the fierceness shines through a lot more from that angle I think. So I'm pretty sure I'll display her like that. Sorry to hear about your cat. Losing a pet is ..
Glad your statue has arrived though! I thought of why she looks off. The statue has a lovely face, she looks sweet. However, in the movie she looks angry and fierce. I think that is why people think she does not have a good likeness. Can imagine if you work on her she would look even better! 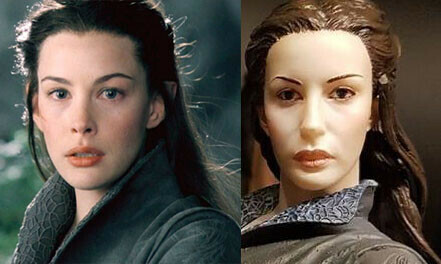 I was really hoping Weta would nail the Liv/Arwen likeness. Last edited by bill59; 8th February 2019, 03:40. The statue looks fantastic, great job by Jane and Weta! I understand how impossible it is to take good shots of the new resin faces, I own both ToE and Isildur and tried many times but none of them looked even remotely like the actual statues. There must be some quality of the resin which causes this, maybe the transparency of the material absorbs the light instead of reflecting it, and just gives a washed out glow from within the resin. 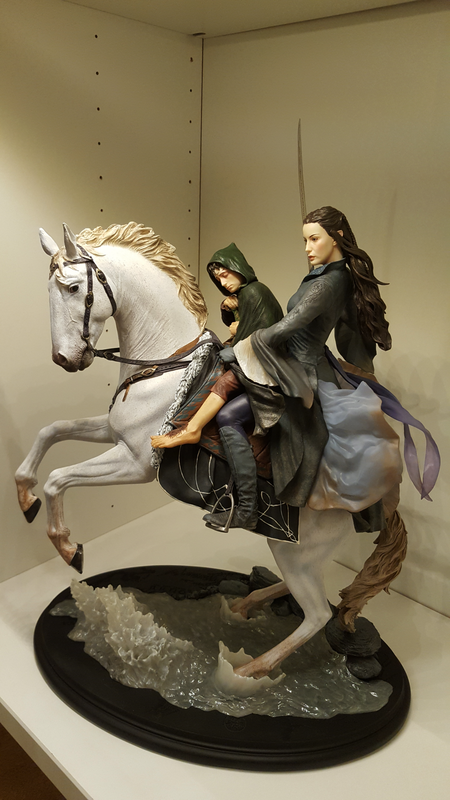 I already own 2 Arwen statues (and the mini statue) but the new one is really tempting! I only own the sideshow version with the flower and have never seen the other one in person, but judging from pictures I think the new arwen is the best of all. I'm sure the statue will look good in person, Bill. I trust yours is already on its way to you? Without a doubt the transparent resin is great stuff but, like you said about ToE and Isildur, being hard to photograph is a bit of a problem for collectors. We tend to enjoy taking and sharing photos of these statues, Weta. It's kind of our thing. Just unpacked mine, first thing I noticed was that there was something strange with Frodo's face. Turns out, the end of the sheath had broken off and was resting on his face. Looks to be fixable, but very frustrating. Still have to check over the whole statue, but I can't really spot anything it has damaged. No worries about the face though, she's basically as she was as the prototype. If you didn't like the face then, you won't like it now, but I think it looks very good. Certainly a case of lighting doing its trick with the previous photos. Edit- The trick with the tail is to lift up the statue a bit so you can put the tail in unchallenged, if you try to put it in with the horse standing in the base, it scrapes against a stone, it's basically impossible. Last edited by DarkShadow; 8th February 2019, 06:39. Thanks for these pictures DarkShadow . Very impressive details. Asfaloth neck and head are amazing. I like everything about this statue. 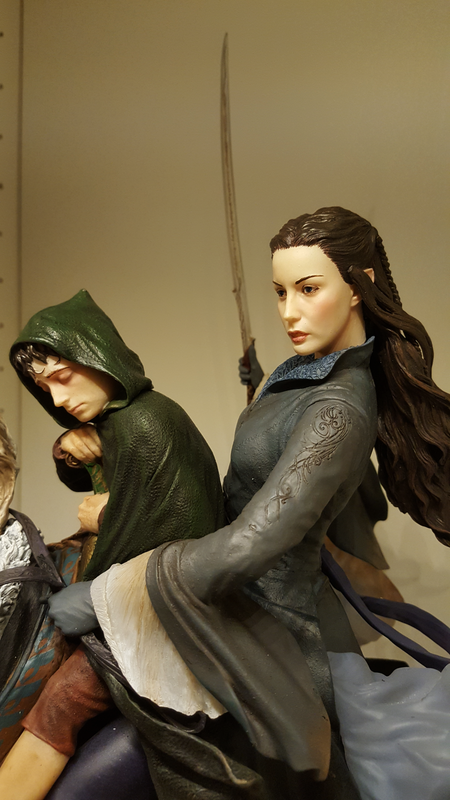 Arwen and Frodo skin tones look very good from here. How do Asfaloth's hooves attach to the base? Is it with metal pins or magnets? If it's magnets, does the connection feel secure and stable? Great pictures of the 'resin' face DarkShadow ! Arwen looks amazing in your pictures. Great skin tones etc. The detailing that is in this piece is magnificent! Thanks so much for taking the time and effort to add pictures of your statue. It comes supplied with a bottle of glue and a good luck note No pins, it just slots into the base, I guess it's magnetic.